SDRSharp (http://www.sdrsharp.com ) – used to pull the signals off of the NooElec SDR receiver. dl-fldigi (https://github.com/jamescoxon/dl-fldigi ) – used to translate the radio signals into readable text. BalloonMapper (http://tinyurl.com/MarkGilbertSource, “BalloonMapper.zip”) – a small application that I wrote to convert the data strings from the capsule into a coordinate on Google Maps. We would copy a dataline out of dl-fldigi and past it into the “Data Line” box (#1). We could then hit Enter, or manually click the “Find Position” button in the upper right corner. This would extract the altitude, and the lat/long from the data string. It would convert the former into feet and display that in the “Altitude” box (#2). 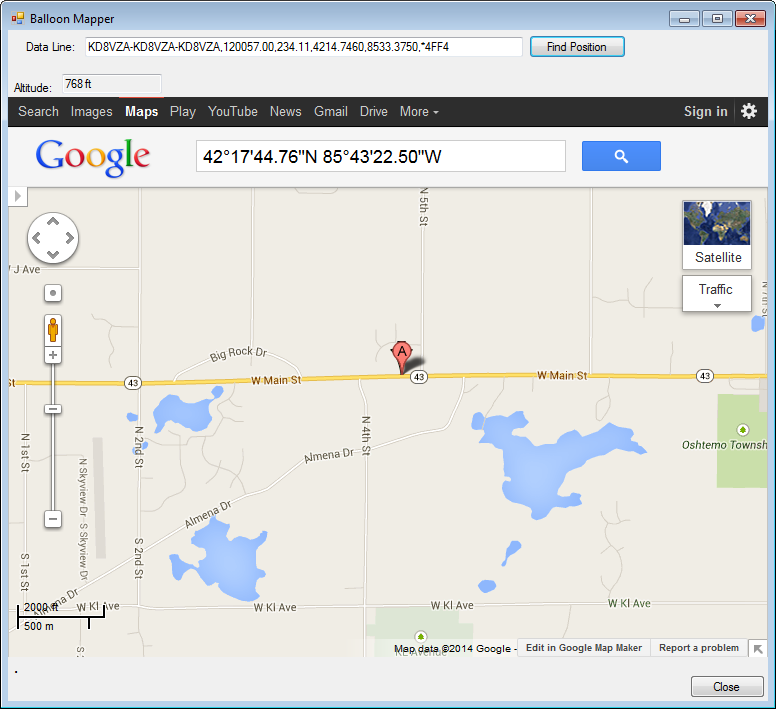 It would also create the Google Maps URL that would show the lat/long as a pin on the map. The first part of the string got chewed up because it took us a second to tune dl-fldigi to lock onto the signal. That’s the main reason I start the string with three copies – I wanted to give Katherine or I (whoever was working the radio) a second or two to get ahold of the signal. Extracting the altitude was very straightforward. Simply grab the 3rd piece of data in the string, multiple it by 3.28 to convert it from meters to feet, and display it in the box. So, now I had my URL. I needed a way to embed a browser into BalloonMapper, which was a Windows desktop app. I looked at a few options, but eventually settled on Gecko Effects: https://bitbucket.org/geckofx/geckofx-29.0/downloads. I downloaded Gecko Effects 29.0 (see link above). Gecko requires another application called “xulrunner”, which I obtained from here: http://ftp.mozilla.org/pub/mozilla.org/xulrunner/releases/29.0.1/runtimes/ . I found that I needed to match the version of xulrunner to the version of Gecko, otherwise I got a “Specified cast is not valid” error. I also found that the program has to be installed to a folder called “xulrunner” – all lowercase – or it wouldn’t work. For full source code and binaries, please visit http://TinyURL.com/MarkGilbertSource, and look for the BalloonMapper.zip archive.